Since the late 1970s, when a wave of contemporary immigration to the United Kingdom was supplemented by an influx of Islamists from Arab and South Asian countries, the United Kingdom has had to figure out how to best incorporate different ideologies within its liberal-democratic socio-political structure. In the mid-1990s, with the arrival in the UK of Arab jihadists with ties to al-Qaeda, the effectiveness of state multiculturalism and its relaxed attitudes towards beliefs that go against democratic values were once again put to the test. Being both a close ally of the United States – even in controversial foreign policy decisions – and a country that hosts a large population of Pakistanis who can easily access terrorist camps and militant groups in Afghanistan, the United Kingdom has seen an estimated 850 jihadists travel to Syria and Iraq in the name of jihad. It is also unsurprising that, since 9/11, a few hundred convictions have been made on terror charges, and that al-Qaeda and Islamic State affiliates have managed to carry out attacks in the UK, in spite of the fact that the British security apparatus has prevented the unfolding of other major plots. Understandably, the 9/11 attacks accelerated the necessities of the security services and the police to combat Islamist terrorism abroad and at home. While initially the main threat was believed to originate from foreign nationals travelling to the United Kingdom, with the foiled shoe bombing attack of December 2001 and the London bombings of 2005, British Muslims came under the spotlight. Religious leaders and their followers were questioned over their alleged connections with terrorist groups, while funding became available for local governments to monitor Islamic extremists. Councils entered into partnerships with the police, and the security apparatus increased the surveillance of Muslim communities. At the same time, legislation came into place to deal with the increasing threat posed by Islamist terrorist activities. The Anti-Terrorism Crime and Security Act 2001 (ATCSA) authorised the imprisonment of foreign nationals suspected of international terrorism for indefinite periods of time. The police were given extended powers of investigation, stop and search, and detention in relation to terrorism. The Prevention of Terrorism Act 2005 (PTA) instituted judicially-authorized “control orders” for uncharged terror suspects, extended imprisonment to include British as well as foreign nationals, but repealed indefinite detention. The Terrorism Act 2006 added several additional measures. For example, it outlawed the “gloriﬁcation of terrorism”, criminalised the preparation of terrorist acts, terrorist training and the dissemination of terrorist publications, while extending the detention period without charge for terror suspects from 14 to 28 days. The Terrorism Prevention and Investigation Measures Act 2011 (TPIMS) replaced “control orders” with lighter restrictions in terms of movement, communication and financial activities. Lastly, the Counter-Terrorism and Security Act 2015 (CTSA) was enacted to better deal with Islamic State-related terrorism and foreign fighters. Therefore, it allowed authorities to retain or invalidate passports, amended the Data Retention and Investigatory Powers Act 2014 and increased powers to intercept communication. It also placed the prevention of terrorism – that is Prevent, one of the four “P”s (Pursue, Protect and Prepare being the other three) of the country’s Counter Terrorism Strategy (CONTEST) – on a statutory footing, thus devolving the delivery of some preventative counter-terrorism functions to public authorities. Legislation has not passed without criticism, however, as it raised competing claims between security and human rights. The indefinite detention of terror suspects (ATCSA) clashed with the deprivation of liberty under Article 5(1) of the European Convention of Human Rights (ECHR). “Control orders” (PTA) clashed with the deprivation of liberty (EHRC, Article 5), the denial of fair trial (EHRC, Article 6) and the interference with right to family life (EHRC, Article 8). Their amended version, that is TPIMs, are civil orders and, therefore, they deny procedural rights for crime suspects under Article 6 of the EHRC. Before being scrapped by the Protection of Freedoms Act 2012, Section 44 (s44) of the Terrorism Act 2000 allowed authorities to stop and search people in any location without requiring reasonable suspicion. According to research, “the combination of local level (individual and community) and macro-level accounts of the use of s44 powers has resulted in Asian men feeling as though the perception of them as inherently suspicious has become normalized”. Equally controversial is Schedule 7 of the Terrorism Act 2000, which allows authorities to carry out stops and searches at airports without requiring reasonable suspicion. Altogether, as the United Nations’ Special Rapporteur on Counter Terrorism and Human Rights Ben Emmerson, QC reminds us: “Human rights-abusive policies increase the presence of terrorism. You only have to look at the recent past in Northern Ireland where internment without trial turned the IRA [Irish Republican Army] from a group with little support into a much larger organisation”. Essentially, the competing claims between security and human rights are a result of the “architecture of surveillance”. On the one hand, the crime control model prioritises the prevention of criminal activities and supports net-widening security approaches. One the other hand, the due process model prioritises the right of privacy over and beyond the necessities of law enforcement agencies. The former model is supported by law enforcement agencies, which argue that “if you have nothing to hide, you have nothing to fear”. The latter model is supported by civil liberties groups, which believe that unchecked surveillance limits freedom of expression, including views that may go against democratic values and that are now dealt within the Counter-Extremist Strategy. This strategy seeks to target people who (1) justify violence, (2) promote hatred and division, (3) encourage isolation, (4) propound alternative systems of law, (5) reject the democratic system and (6) carry out harmful and illegal cultural practices. 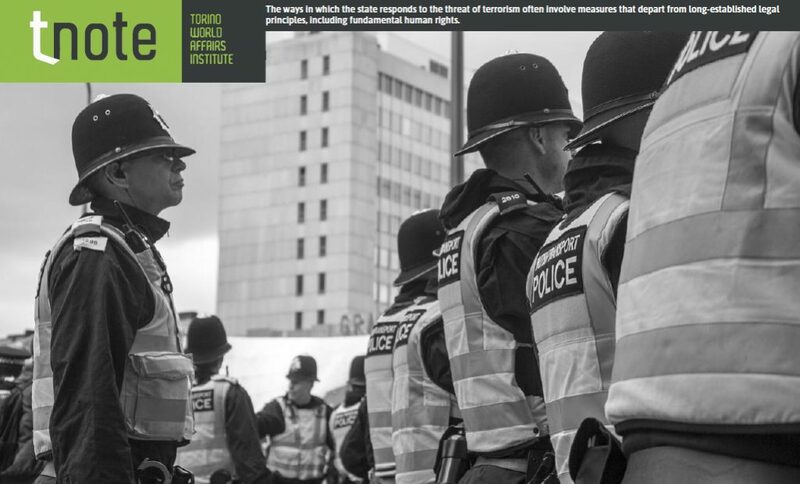 Whether counter-extremist approaches, counter-terrorism strategies and the prevention of violent extremism will reduce the threat of al-Qaeda and, especially, Islamic State-related terrorism within the United Kingdom remains to be seen. What is certain, however, is that they will continue to raise questions about how can a democratic country strike the right balance between being a purveyor of security and protecting human rights. Stefano Bonino is the author of Muslims in Scotland: The Making of Community in a Post-9/11 World (Edinburgh University Press), finalist of the Saltire Society Research Book of the Year Award 2017.